The Galaxy Note 8 is one of the most hotly anticipated smartphones of 2017, and now we know the day on which we’ll get to officially meet Samsung’s new flagship smartphone. Samsung is hosting a Galaxy Unpacked event at 11:00 am ET on August 23rd. The company isn’t saying much about what it’s got planned but there is a teaser image that we can dissect. As you can see in the image above, Samsung is using a teaser style similar to the one that it used for the Galaxy S8. This time, though, there’s a blue S Pen included, which hints at a Galaxy Note device since the S Pen is a main feature of those phones. 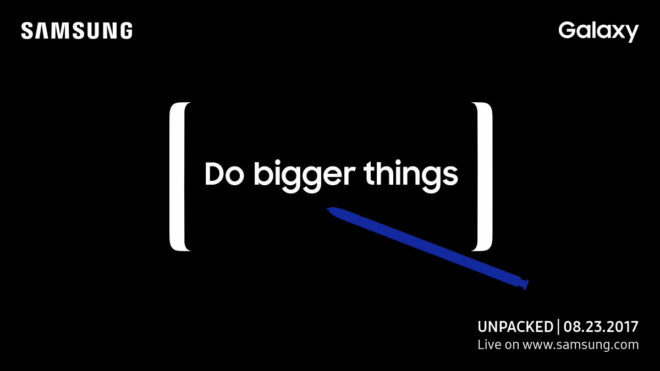 Then there’s the phrase “Do bigger things”, which also seems like a hint at a new Note since those phones are always larger than the Galaxy S devices. Are you looking forward to the Galaxy Note 8? What do you want to see from the device? Galaxy Note is da bomb! Me too. I hope they do it. I don’t understand the BOGO. Don’t you need to open another line. So if you are grandfathered into Jump 1 and the original unlimited data $50 it does no good correct? If this note 8 doesn’t have at least 6gb of ram, quick charge 4.0/comparable, and 4k with hdr. It’s dead on arrival, sorry Samsung had one year to repair it’s damaged reputation from the Note 7. If you expect the consumer to spend close, if not over 1k for a high end device, it better deliver. Cant wait to see those specs when the new iPhone releases! He/She was responding to my first post over requirements to regain support of those burned by the note 7. For a flagship device, it’s a must now, example Sony Xperia XZ premium offers 4k with hdr. If Samsung expects any consumer to play ball, it’s gotta have the features to back it up. So, are you saying without those features you would still buy???? I hope not, especially if the device cracks 1k in ownership. Yes, I use the OnePlus 3 because many of the devices just don’t have all the specs, I would desire in a smartphone. The closest is the Sony Xperia XZ premium, but only having 4gb of ram puts a damper in what I could true enjoy to the fullest. Same with me. With the iOS conference back in Jun, it doesn’t seems to be any WOW factors with iOS 11. So I’m presuming that the next iPhone might not have any WOW factors (as the previous iPhones releases) besides less bezel, minor physical changes, maybe upgraded camera, upgrade ram and a higher mark-up price. I’m interesting to see what the Note 8 have to offer. I totally enjoyed the Note 7 before the recall, but I might just end up keeping my iPhone 7 plus if the Note 8 & next iPhone doesn’t have anything that makes me I need to have it Lol. i know i mean awesaome 1080p screen from iphone 8 and itll be 2018. Forget 4K, just give me 1080P with a battery that lasts 3 days. With 4K screen of over 6″ the battery is not gonna last the whole day. Many high end smartphones, if used moderate to frequent will be lucky to see a day worth of battery life. I wish companies would add more internal battery life, but after the note 7 debacle. Samsung is playing safe this time around with a smaller battery capacity than previous generation. This phone is gone be close to $1,000 out the gate. No thank you Samsung. I can’t wait. But plan to wait for a good promo. No thanks Sammy, if I replace my V20 it will be with a V30. Sorry Samsung, but I’m done with your mobile products. Purchased an S8, and I can’t wait to replace it. Miss stock Android. Why are you reading about the Note 8 if you are done with it? Nothin and I mean nothing tops the Note series. Especially the S-Pen. No other phone can top those features. But then again, that’s my opinion. Can’t wait for the Note 8. I have had all of the Notes, but i noticed that on the S8+ that I could use my finger and do almost everything the note did, annotate photos, etc. It has a lot of the same software and you can put the note software if you want. So its not a bad substitute until the Note 8 comes out. I don’t care what it has I gotta have it. I miss my S Pen so much. I’m tired of the “S” series. I loved my Note 7 so much. Im excited!